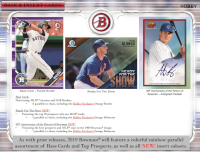 BASE & INSERT CARDS – As with prior releases, 2019 Bowman will feature a colorful rainbow parallel assortment of Base Cards and Top Prospects, as well as all NEW! insert subsets. Base Cards – Showcasing MLB Veterans and 2018 Rookies. 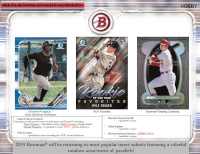 RETURNING INSERT SUBSETS – 2019 Bowman will be returning its most popular insert subsets featuring a colorful rainbow assortment of parallels! Chrome Prospect Autographs – Featuring ON-CARD autographs of the top prospects of MLB. Chrome Rookie Autographs – Autograph variations of the Rookie Base Cards on chrome technology with ON-CARD autographs.